The wide world of Switch ports got me excited for new things on the platform, so I asked our excellent community image editors to come up with even better ports. I now need all of these to exist. The Switch is the console with infinite possibilities. Those two little controllers and their big screen friend can enable any kind of gameplay that you might be interested in. That includes yard work. People want lots of games on the Switch, but I’m also interested in novel experiences, and so the winner and honorable mentions this week reflect all of the different things we wish we could be getting from the Switch. BTKerrproductions delivered the ultimate Nintendo product. Both a nostalgia product and a hardware jump forward into brave new worlds, the Super Game Boy Switch Adapter is an object of beauty. Finally I can play...those original Game Boy games...on the go? Don’t think about it too hard. The honorable mentions this week all absolutely nailed it as well, and there are lots more where these game from in the comments to last week’s post. Go look through them. They’re good! Florzinha got the deepest, crunchiest game onto a handheld console. I imagine that the Switch would actually melt in your hands during world generation, though. DevTek asked us to skip an important family event to check out this classic RPG on the Switch. Bob knows that the most exciting thing you can do with a bike is pretending to do something else. 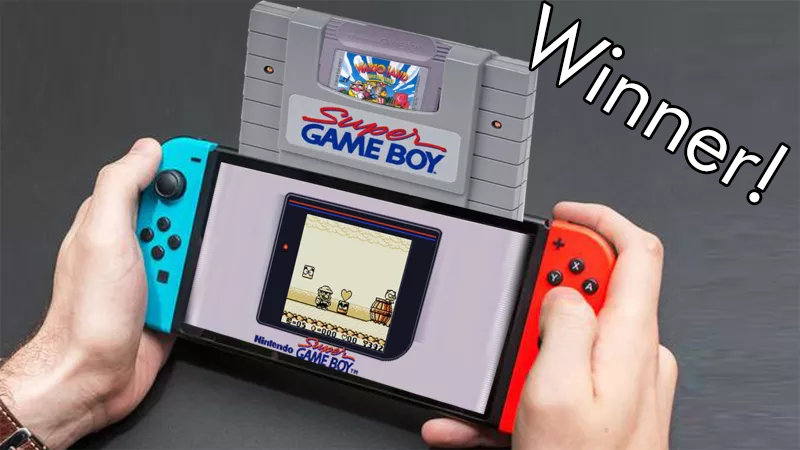 And now you can do that with a Switch! GraysonW finally deposes the idyllic apocalypse of Breath of the Wild with a real idyllic apocalypse game. Iharm takes the ultimate human experience of getting creeped the hell out and puts it on a console where you can nudge the cursed object with a controller. The end result? A masterpiece! ZMAN2018 puts those controllers on something worth doing! Convince your friends and family to “connect” while really making those lawn edges pop. Now you’re thinking like Miyamoto! ImmaLion finally put a good game on the Switch. I’ve been waiting so long. JohnyThrow’s creation literally made me laugh out loud. How does this control? Do you need to use your body in some way? Is there wiggling involved? TBW44 is getting the classics on the console known for classic experiences. Silverwind asks us if we will play the ultimate game with Nintendo’s portable doom machine. Would you like to play a game? Mortal Dictata put It on the Switch. I’m confused about who is doing what with these controllers, but I will allow it for comedy. thoregon understands what the Switch really needs. It needs big mechs, lots of controls, and probably fifteen different operable screens that do distinct things. The Switch needs to put up or shut up! &apos;Shop Contest: Celebrating Our Favorite Witcher, Winners!